While I'm on the subject of butterflies (next post down) here's a neat little graphic from the Natural History Museum in London advertising its new Butterfly Jungle (title link). 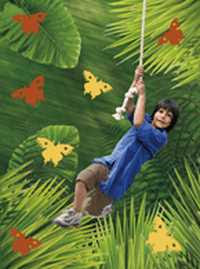 This is perfect for junior nature lovers in the school summer holidays. The bad news is the price of admission: adult £6, child £4, silver surfer £4, family £17. These prices include a small "voluntary" donation to the Museum. If you choose to opt out - I would - the prices are adult £5.40, child £3.50, silver surfer £3.50, family £15. That's quite stiff enough without paying a "voluntary" surcharge. Children aged 3 and under are allowed in free, but who wants to lug them around London? Your local park or your nearest library would provide more fun and less hassle than London Underground and bendy buses full of rowdy yobbos.